Grade B Bulk Pack (single pack) - Global Maxlink Inc. - A primary importer of sushi nori seaweed! 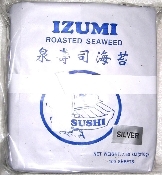 Izumi Brand Silver Bulk Pack uses the same High Quality Grade B Silver Nori Sheets as our regular pack, but with significant cost savings on larger quantity packages and case. *** Shipping Detail *** -- Single pack order will be shipped via USPS Parcel Post or Priority Mail. All case order will be shipped via FedEx ground. Express shipment is also available with extra cost upon request. There is a surcharge for order shipped to Hawaii and US Virgin Islands. You are welcome to contact us to confirm actual shipping cost to Hawaii and US Virgin Islands.